Latimer and people like our friend John, were pleased because the great shrine statues of the Virgin Mary in England, which the people had venerated for centuries, were being sent to London to be burned. They were to be destroyed just like the religious houses that had grown up around them. For Latimer and his friends, many of whom were to become vastly rich through the sale of church land, this was a good thing. Why? Because for them, the catholic religion, substance and outward sign, doctrine and popular expression, was so much blasphemous fable. The statues of the Saints and the devotion that centered on them was a simple matter of idolatry; these things detracted from the worship due to Christ alone and were therefore idols to be destroyed. A fitting punishment for graven images that led men to hell fire itself. Well, they were burned, sometime in 1538, in Chelsea, and Latimer was a happy man. The idols had gone, the chief ones anyway, and so had their shrines, not least Walsingam. tops pearsed once to the skye. So who was right, the iconoclasts, or their opposition? The people who destroyed the images and grew wealthy on the despoiling of the Church, or those who stood for the ancient devotion of the land? To put it another way, who was right, parishes like ours, or those who scorn us as ignorant, possibly blasphemous idolaters? Obviously we think we’re in the right, otherwise we wouldn’t be celebrating this Feast, held in honor of the Blessed Virgin, nor would we process with an image of Our Lady around the church. Even so, we owe it to ourselves and to our opposition, ancient and modern, to clarify our position. Latimer was wrong, we are not idolaters. 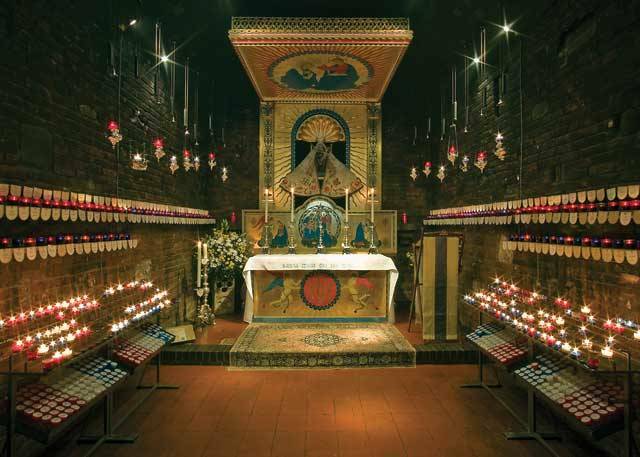 When we light a candle at the Walsingham Shrine we are not bowing down to a pagan deity, that “great sybil.” We are not worshipping her as a god, on the contrary, we are asking the Virgin to pray for us, because we know that she is alive and in heaven. And just as we ask any holy person alive on earth to pray for us, so too do we ask the same of those in heaven, especially holiest of them all, the great Mother of God, who brought salvation into the world. More than this, our outward devotion to the Saints, not least Mary, with its shrines, statues and candles, isn’t some unnecessary distraction from the worship due to Christ alone, but flows from it. Good Christians naturally want to celebrate the lives of men and women of outstanding sanctity as these people are heroes of the Faith, demonstrating the redeeming power and love of Christ. They show us that the business of our religion is true, and so we set up representations of them in our churches to lead us to greater devotion to Our Savior who was glorified in their lives. This isn’t graven idolatry, it's the normal piety of the faithful throughout the ages, of people who love Jesus and therefore love His Saints and most especially His Mother. What we’re doing tonight, on this Feast, is putting that wrong to rights. We are returning the Saints to the people so that we, in our turn, may strive to be Saints, helped on by their glorious example and aided by their powerful intercession. So tonight, as we light candles in honor of Our Lady, may the light of Christ’s love burn brightly in us that we too, with her, may join the heavenly host of souls redeemed by the grace and love of God.